Can space exploration be used to build trust between parties? "Space exploration is one of the few areas of politics that still offers significant opportunities for bipartisan rapprochement." "A shared passion for space can lay the groundwork for a relationship between individuals of very different political beliefs." "Treating people as apostates is not a path to changing their minds, it will only ossify them in opposition. It may not always work, but our ideals demand that we try." You are now a tool of science deniers. I will never give another penny to the Society nor watch another Nye show. I've had the pleasure to meet Hawking and several Nobel-winning physicists, but Bill has a chance to meet someone with a really big I.Q. Totally agree...the job of the PS is to work with the people who are, read carefully --actually in charge-- regardless of what we may think about them. 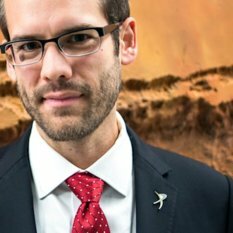 Bill and Casey are there to push for for Planetary Science, and that means educating people in power, not shunning them because they disagree, even when that disagreement is large. To storm away from the table like an angry teenager means having no influence in the important decisions that will be made in the next 4 years, and I for one do not pay dues so we can sulk. I pay them to have a voice at the table, and push to get hardware into the sky. I have criticized Bill for actions I thought got in the way of the mission of the PS, but I agree with him on this one. I'd rather he have a positive influence and change some minds in the administration than "stay pure" and leave them to make decisions based on their own ignorance. A beautifully expressed and absolutely correct post. From what I've read, Bridenstine doesn't seem like the ideal guy in terms of scientific space exploration in general, but the pure religious frenzy and monomania of "Climate Change" (which most believers are totally incapable of recognising they are religiously and obsessively locked into) is no reason to avoid interaction with decision makers. Absolutely fascinating that Casey, who is clearly a mainstream acceptor of climate change -- and good luck to him -- uses the word "apostate" to designate how most climate change proselytisers would frenziedly like to treat Bridenstine (and many, many others). That unequivocally religious term is indeed an exact description, exactly the correct term, for what's going on in those religious believers' minds. Finally, just because Bridenstine accepts that "climate is changing and that humans play a role", doesn't of course mean that he thinks it's automatically the end of the world. He probably thinks that humans' role is not yet fully defined (perfectly reasonable), and wonders why modest warming would automatically be a cataclysm when migration since WWII has overwhelmingly comprised untold tens of millions seeking numerous degrees Centigrade of warming -- see Florida, California, whole US Sun Belt; Northern Europe to Mediterranean; the Russian Riviera; Chinese to Hainan; Australians to Queensland, etc, etc. Globally, literally trillions have been expended seeking MUCH higher temperatures! Lots of other issues of course, but all just confirmation that the PS must talk to Trump & Co. Sorry... You can't get anywhere with people who actively eschew fact. Politicians that support policies that are ruining our planet are to be resisted. Nye ran a real risk of being a figure in a scientific Potemkin Villiage -- and we may yet see that happen with the Representative's campaign marketing. I've decided to cancel my membership and have requested that all my contact information be removed from your records. You're wasting my money and no longer represent my my views or interests. I think Bob hit it on the head: The Society's advocacy efforts are all about "educating people in power," not engaging in electoral politics, however tempting it may be. We can be effective in advocacy only if we maintain relationships across political cycles. This is important for any advocacy effort, but perhaps even more important in space exploration: We have to play the long game in order to support missions from conception to execution -- a process that can span decades and four presidential administrations. The challenge is what to do with politicians who are acting in bad faith. You don't want to waste time on them. At the same time, you don't want them to turn on you and polarize your bipartisan cause; they have the power to ruin us. I think this requires treating them respectfully, but also standing up for our cause. So attend the speech or whatever, but make clear in public and private what our stance is. As "Anonymous" writes above, you don't want to be a tool of those acting in bad faith. As a Society member, I support the CEO's attendance at the address. Keep up the good work. But also, please make sure that everyone knows where we stand: with science. Right, wrong or indifferent Bill, you just made yourself a tool for the far right. They can now point to your attendance and use it to claim you support their position. I am left of center but support Bridenstine because he wants to go back to the Moon which I feel is only path to human expansion into the solar system. That said, I despise the whole NewSpace ideology and am no climate denier so.....the rock and the hard place. Nye made his decision and we cannot know all the factors that played into that decision. Some of the comments here indicate members are wholly invested in planetary science. I am also in a different camp from them: in my view the science can wait and we need to get off world independent colonies functioning. Not on Mars. Gerard K. O'Neill ruled out colonies on natural bodies early on simply because of the lack of gravity. The space colonization movement of the 70's, which sought a cure for climate change with space solar power, has not been forgotten by some of us. I've been with TPS since its creation, and corresponded with Dr. Sagan many times on the topic of our stewardship of Earth and how we should study other worlds to better understand our own planet. Our founders were also passionate about popularizing science as a powerful and effective way to understand the universe. We must be clear that science is about knowing and not believing. On the established science of global warming and climate change, it is one thing to engage with people who have a different, or uninformed point of view, but quite another to associate with an individual who actively works to undermine science and misrepresent information in a public form. Watch this YouTube video, and then tell me that Bridenstine is a guy that TPS can get behind: https://www.youtube.com/watch?v=GUcsAFnwC7k Remember when Dr. Sagan declined invitations to the White House from Ronald Reagan? When we associate ourselves with disingenuous, anti-science, irresponsible public officials, we are judged accordingly. "Remember when Dr. Sagan declined invitations to the White House from Ronald Reagan? " No I do not. However, I remember him working for NASA, a government agency, during the Reagan administration and Richard Feynman, who was a genius, serving on the Challenger commission. There are some things that are simply too cool to pass up. A State of the Union address is one of them. I don't fault Nye for that. What I fault him for was not viciously attacking "creationist astronomy" during that notorious debate some years ago. When fighting the good fight, you have to go into "enemy territory" every now and then. Being "pure" isn't always a good thing. I feel tremendous sympathy but also strong support for the non-partisan, patriotic men and women in public life who continue to serve civil society, keeping the pillars of the free world from collapsing. In the past year we've seen deliberate attempts to undermine, discredit or otherwise sabotage important work done by public servants at NASA, NOAA, the FBI, the CDC, FEMA, the EPA, among others. The work of honest journalists and scientists is continuously misrepresented and construed, and the free press is threatened and lambasted by our political leaders. The recent attempts to destroy public confidence in the FBI and Justice Department are flagrant and disgusting examples of this misbehavior, which can only serve to diminish the effectiveness of our democracy. With Trump and cronies, the offenses against democracy, science, civility and decency are so egregious that we shouldn’t be so foolish as to start building bridges with these folks. We need to get them out of office. For me, the notion of having Bridenstein as the head of NASA is as ridiculous as it is offensive. And for Dreier to categorize Bridenstein’s recent opportunistic change of heart as a ‘greatly improved public stance’ is naïve and unconvincing. Nye didn’t have to be part of Trump’s tapestry of notables to be an instrument of scientific advancement and popularization. By attending the State of the Union, the only thing he was popularizing was Trump and the GOP. The best you can say is that Nye stands for planetary exploration at all costs; at ANY costs, including looking like a puppet of extremist, anti-science buffoons and for me, that’s not very inspiring. TPS should be about more than that. I agree that reaching out to all sides is necessary. But, I guess I would prefer the society is not used as a political tool by those who don't believe in basic science- which is what this feels like. I mean, it may be necessary for our gov't to reach out to North Korea, but we don't have to waive their flag. But, then, I'm a small player here. Personally, I think it’s great that Mr. Nye went. What’s wrong with working with people to advance the society’s agenda? More disturbing — the justification that everything is OK because Mr. Bridenstein is not guilty of a thought crime (“To his credit Bridenstine testified before the Senate that he accepts the climate is changing and that humans play a role in that”). So what if he doesn’t believe in global warming? Time will bear out the answer. It’s far from “basic science” and the evidence isn’t as clear as some claim it to be. If you’re so confident in the facts, let them be examined. Calling anyone who questions something a “denier” is not science, it’s anti-science and shows a belief or faith in a perspective, not the correctness a perspective in and of itself. After Nye made that statement a couple of years ago, that he would be open to jail time for denier's. Although he did walk it back a few days later. I no longer look at him as a science guy. It reveiled what's in his heart and that's a direction I don't want science or this country to go. Should Bridenstine have invited someone with those beliefs to the SOTU? I agree with Ichiban’s comment, and I wish Mr. Nye had not said those things. He is a polarizing person, to be sure, and those sentiments do not reflect well in the Society. But, surely TPS has done the calculations and has decided that it’s ultimately worth the price of having Mr. Nye, not simply as a team member, but CEO. It’s a price they seem willing to bear, and that is their decision. Personally, I wish TPS had someone who was *actually a planetary scientist* as CEO — I think that would fit the TPS mission and goals better. Maybe in the future? I suspect that it would be beneficial and take away from the distractions related to things such as who went to the SOTU with whom. It's often said that in political and budget battles you're either at the table or you're on the menu. Given that, it would have been crazy for Bill Nye to turn down Rep. Bridenstine's invitation to attend the SOTU address. At the same time, Bill and the Planetary Society need to clearly and consistently support the scientific community in maintaining the reality of human-caused climate change. Most of all, the Society must support the call for adequate Federal funding of the resources needed to monitor the Earth's changing climate. There may be some argument possible about the relative roles of NASA and NOAA in the process, but some agency needs to do it, and probably they both have important parts to play.